I’m pretty sure RIDOT sent this same exact Tweet last time we had a giant storm and I sent the exact same reply.
.@RIDOTNews Also don't clear the snow onto the sidewalk, it creates hazards for others. Also, the Mayor wants all the sidewalks clear by tomorrow afternoon, but don’t ever put any snow on the street!
. @Jorge_Elorza Can the plows be cognizant of pushing snow back onto sidewalks? Frankly, I’d encourage everyone to refuse to shovel their sidewalk if it didn’t make life harder for pedestrians. As it is, I’d encourage everyone to shovel back into the street. Let the plows come by and deal with it. In Manhattan the sanitation workers and other workers clear the sidewalks. Often off the sidewalk into the street; the traffic in the street melts down the snow and can traverse it better than pedestrians can on the sidewalks. There is no reason why people who live in single family homes, or even 3 families, should be somehow exempt from clearing their sidewalk. If they are clearing their driveway to get their car out to go to work, they can do their sidewalk too. Considering that the resources for the most basic snow plowing of actual main arterial roads is not nearly enough for big storms, who is going to pay for the city to shovel the hundreds of miles of sidewalks in the city? I am not sure what docs Ryan is looking at but Denver requires property owners to shovel their sidewalks. Denver requires property owners to clear their walkways so that EVERYONE has safe access throughout the City! Senior citizens, people with disabilities, parents with strollers, and mail carriers -just to name a few -struggle to negotiate hazardous walkways…we need to do our part to make our community safe and accessible for all. Homeowners: Once snow has stopped falling, residences have twenty-four (24) hours to remove snow from public sidewalks adjacent to their property. Businesses: Once snow has stopped falling, businesses have four (4) hours to remove snow from public sidewalks adjacent to their property. Report A Problem: Please contact Denver 3-1-1 to provide the address of unshoveled sidewalks. Enforcement: Denver performs proactive inspections in business districts, and we rely on citizen complaints to help us identify those property owners that need to be educated about sidewalk safety requirements. The vast majority of people comply with the first sidewalk safety notice issued by the City. In the rare instances where a property owner refuses to comply, Denver takes escalating legal action, which can include issuing an Administrative Citation that carries a $150 penalty. Denver manages 3,000 sidewalk safety cases a year. Denver Parks + Recreation performs snow removal on park property and select sidewalks, such as bridges and underpasses within the City. During normal snowfall, the snow will be removed as usual, including around recreation centers. 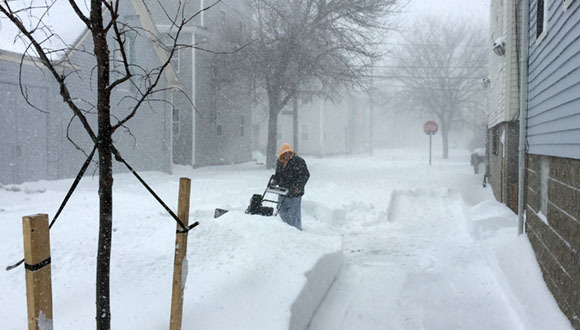 Recreation Centers will also be plowed and shoveled for Saturday and Sunday hours as needed. When it snows, the City launches a winter snow storm operation and follows an initial plan for clearing snow and ice from the highways, snow emergency streets, bus lanes, and other primary routes. As this initial phase is completed, the City moves forward to spread and plow all roadways as necessary. City streets may be spread with salt and calcium chloride and/or plowed to create a passable driving lane, but blacktop may not be visible. The City does NOT clear access to automobiles, sidewalks, or driveways, even if the obstruction was caused by a City plow.